I’m still in shock. Is it really September already? It feels like I was just counting down for summer to begin and now it’s almost over. Next think you know, Thanksgiving and Christmas will be upon us. Many stores already have Halloween decor and candies for sale. Too early, people! It’s one thing to be prepared, but summer isn’t over yet! In my final attempts to hold on to dear summer, I’m sharing one of my favorite cold brew teas. I had mentioned last week that my friends at TeaGschwendner sent me bags of my favorite teas. 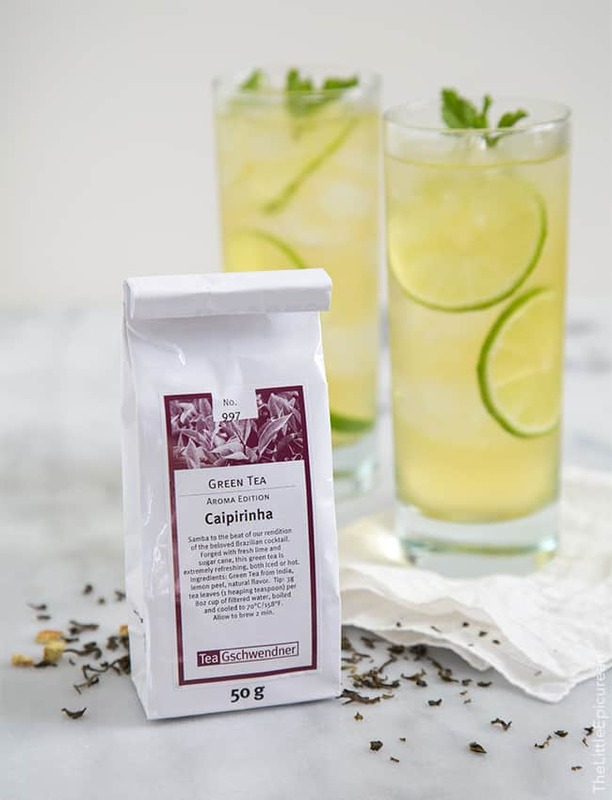 It’s fitting that this Caipirinha flavored green tea is their tea of the month because I’m in love with it. I’ve been sipping on it all summer. 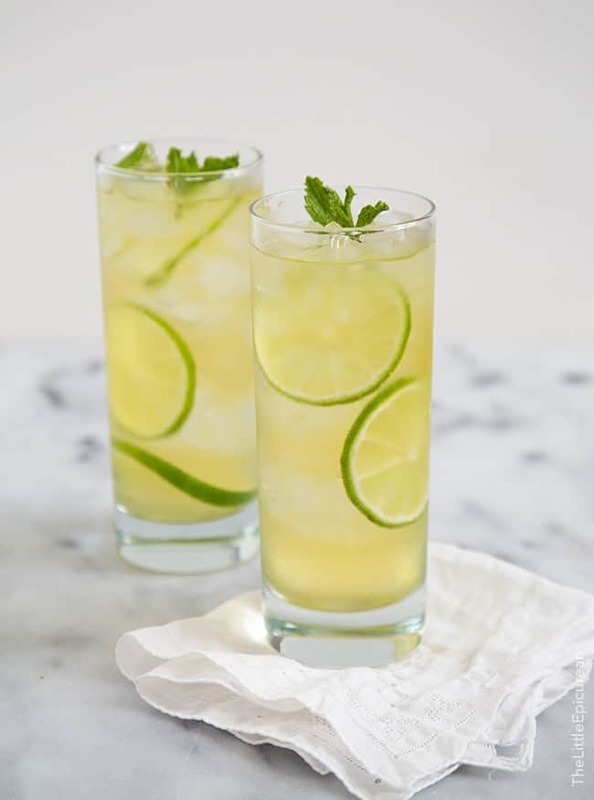 It’s a super refreshing tea, especially with a squeeze of lime juice and a touch of sweetener. The directions on the package calls for you to boil water, cool to it 158 degrees F before adding the tea leaves. Then you have to let the tea steep for 2 minutes before enjoying. That’s a lot of work, especially during the summer months when all I want is cold iced tea. I’m lazy. Let’s eliminate all those steps and cold brew! No need to heat up water or take the temperature of water. Simply add tea leaves and room temperature (or cold) water in a large pitcher. Cover and let the mixture chill in the fridge overnight. The following morning, you have cold tea waiting for you to enjoy! Strain out the tea leaves and discard. Store tea in the fridge for up to a week. Sweetened with simple syrup, honey, agave, etc. I like to enjoy mine with a squeeze of lime and a sprig on mint. Cheers to the remaining summer days! 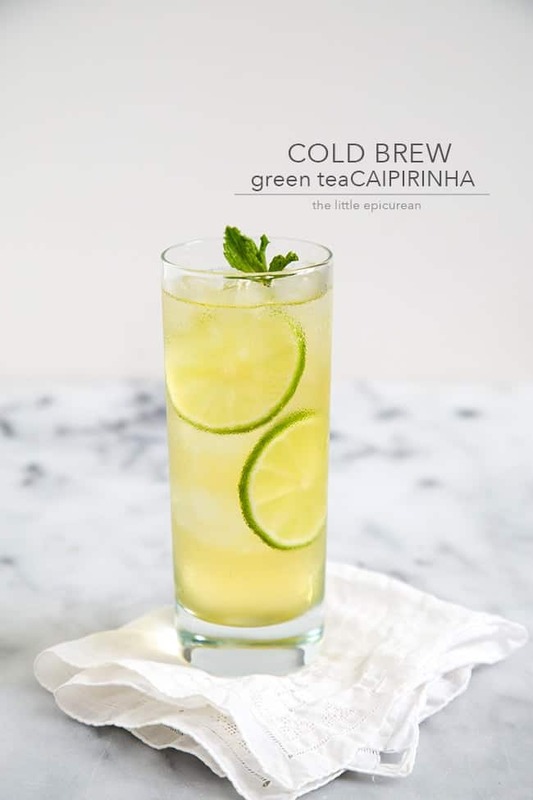 A crisp and refreshing summer tea, this cold brew green tea caipirinha is perfect with a squeeze of lime, a hint of sweetened, and fresh mint leaves. In a large pitcher, combine loose tea and water. Cover and let steep in the fridge for 12-18 hours. Strain out tea leaves. Store tea in fridge until ready to serve. Sweetened according to taste. 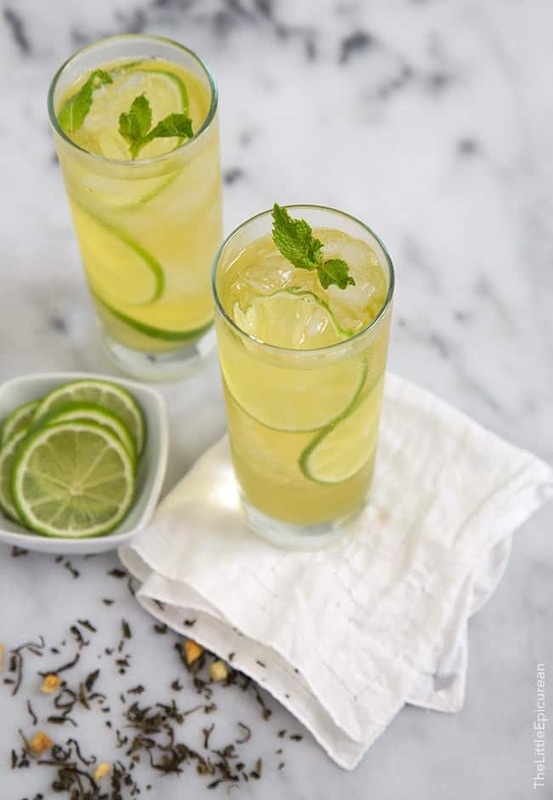 Serve over ice and garnish with fresh mint leaves and lime slices. For more cold brew beverages, check out my Hibiscus Tea or Sea Salt Coffee. Girl I’m loving all your posts recently. As a huge green tea fan and cocktail drinker I love this! We have Halloween candies at most of our grocery stores, and I’m seeing warm comforting meals/recipes everywhere – while I can’t complain …. I too want to hold on to summer as long as possible!! What an easy – refreshing drink … sounds amazing! I’m looking forward to wearing sweaters and boots, but I’m not ready to give up the long days of summer! This looks totally delicious and completely refreshing! Yep, I will be trying this asap. It is available at TeaGschwendner. They have an online store, as well.